SOLD!!!! 2005 Yamaha YZ250 SOLD!!!! I owned this bike for about 8 months. Bought it in the spring, sold it in the late fall. It was pretty nice and I'm glad I bought it and rode it because it settled some questions I had. I would've raced this thing in WORCS or hare scrambles or MX in a heart-beat. The power was great and I felt pretty comfortable on the bike. There were a few reasons why I sold it, though. First because I wasn't racing! For play riding, it just had too much power and speed. For play or woods riding, the gear ratios were too close. I was constantly looking for a lower 1st and a higher 5th. Last, I never got fully comfortable with the supension, esp the rear. Just like my previous YZ250WR, this one kicked me off a few times in conditions where my KX or KDX would've been stable. So, I put it up for a sale and ended up getting my purchase price back. I lost a couple hundred on the mods I made, but that's how it goes! 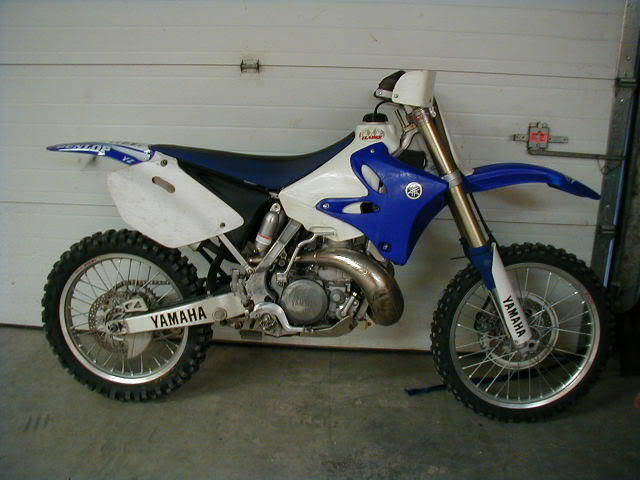 I had been thinking about getting a 2-stroke 250 and off-road-izing it. Kicking around on Craigslist, I found a listing in Albuquerque for a YZ250 outfitted almost exactly to my specs- flywheel weight, large tank, handguards, skid plate, trail computer, pipe and spark arrestor silencer, Scotts triple clamps, re-valved suspension, and much more. Long story short, I bought it from the 61 yr old owner (who'd moved to a KTM 300). It's a great bike but I unfortunately have not had time to go off-road riding like I hoped. Thus, it's for sale. And in the meantime, I'm still riding it. Here's how the bike looked when I brought it home. I actually have already added the rear fender stickers in this shot. I first of all don't like fully enclosed hand guards- they're heavy and I'm afraid of getting my hands caught in them. So, they went on the shelf and some Acerbis open guards went on. Second thing was that I found a see-thru tank on Ebay, complete with brackets and petcock. I bought it, moved my other set of brackets and petcock to the stock tank, and then sold the white tank on the 'bay. Now I can see my gas level. I also siliconed the Trail Tech computer into the bar pad. This works well.